At PreZoomably Cats, an exclusive cat salon in Regina, Saskatchewan, we love it when people ask this question. Our answer is “No, cats do not groom themselves.” They do lick themselves all over and cover their fur with saliva, which in turn creates dander — a significant contributor to allergies in humans. Grooming a cat can genuinely change its life and that of its owner/s. Many clients have informed us their cat changes from grumpy to much more content and compliant — some even say more cuddly — with the Lion Cut. It has been remarkable. 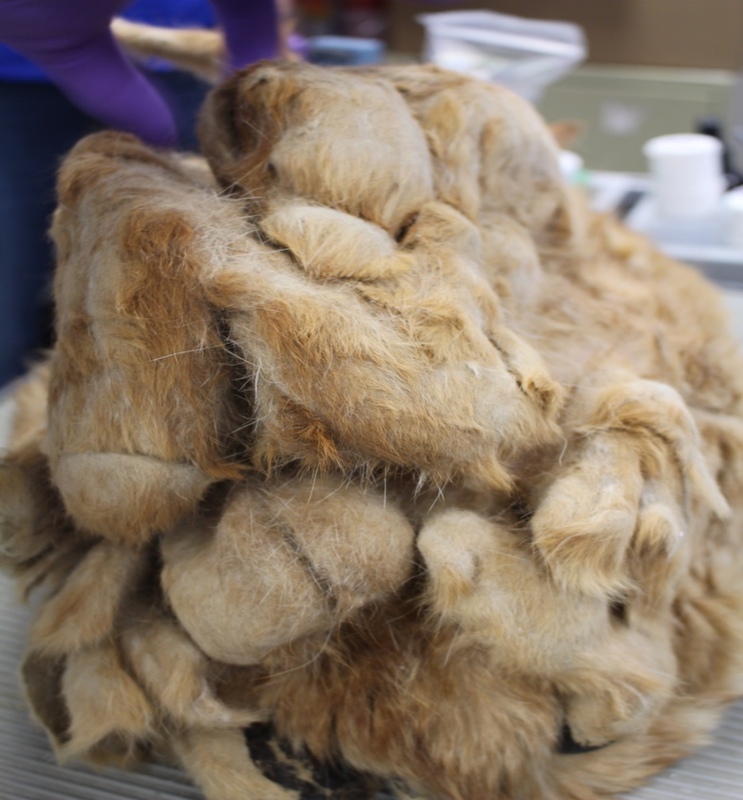 Many of our feline clients felt the only way their cat could be groomed was to sedate it. Not only do we never sedate a cat; we also never restrain it during the grooming process. There is a tremendous need for cat groomers to assist with matted/pelted cats, which in the past have had no opportunity to be groomed by a professional Certified Feline Master Groomer (CFMG). With the right training and equipment, a professional can groom a cat with its health in mind, as well as its safety. Grooming a cat professionally can solve many owner problems, such as shedding, dander, dandruff, scratching furniture, allergies, hairballs, matting, dirty ears, sanitation cleanliness and more. Most importantly - There is a huge need to educate cat owners and demystify the myths, such as "You could never groom my cat," or "Cats hate water," and most of all, the line mentioned earlier, "Cats groom themselves." "You could never groom my cat." The fact is if a groomer is qualified and trained with the proper skills, tools, and techniques; yes they can groom your cat.  In fact, we have three groomers who have become Certified Feline Master Groomers through the National Cat Groomers Institute, and they manage even the most aggressive cats. In saying this, however, we are often surprised at how many clients come in thinking their cat may very well kill the groomer and the groom turns out to be rather uneventful, and the cat was compliant. The fact is, all cats do not hate water. 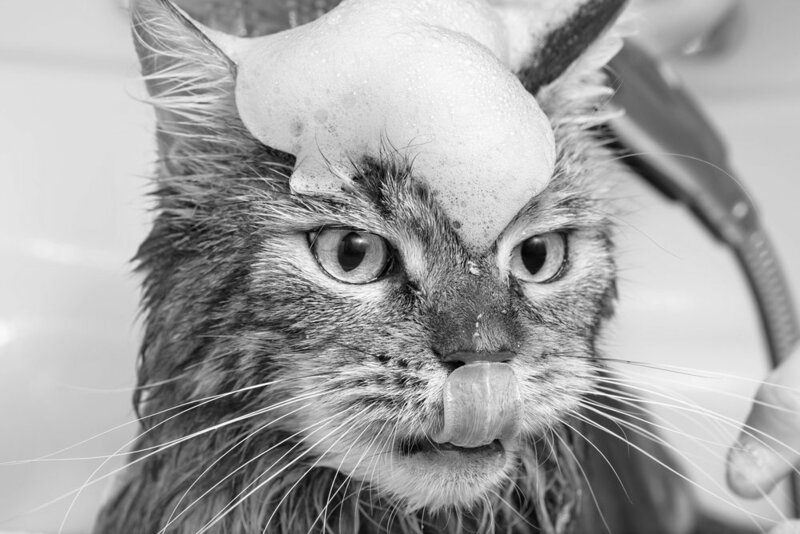 In fact, when we deem a cat aggressive through our assessment, the first thing we do is take it to the bath. The bath calms the cat down and enables us to complete the groom. Here is a cat that is quite enjoying its bath time. Fel d 1 is the allergen that is so toxic to many cat allergic humans. The saliva the cat deposits along with the enzymes and the inherent greasiness creates a situation where mating occurs. If your cat is short coated it turns the coat to a lack-luster appearance and it isn't pleasant to pet, plus the "smelly cat" syndrome exists. Sometimes clients are not even aware their cat is matted. A mat on a cat can be woven so tightly that it can be confused with the skin. When a cat is pelted, it causes all kinds of issues. The air cannot penetrate a pelted area and reach the skin. Often moisture and bacteria are harbored in the pelt and skin irritations, or even infection can occur. Also, there's the fact that the cat's mobility is impeded. Mats and pelts are painful for cats! 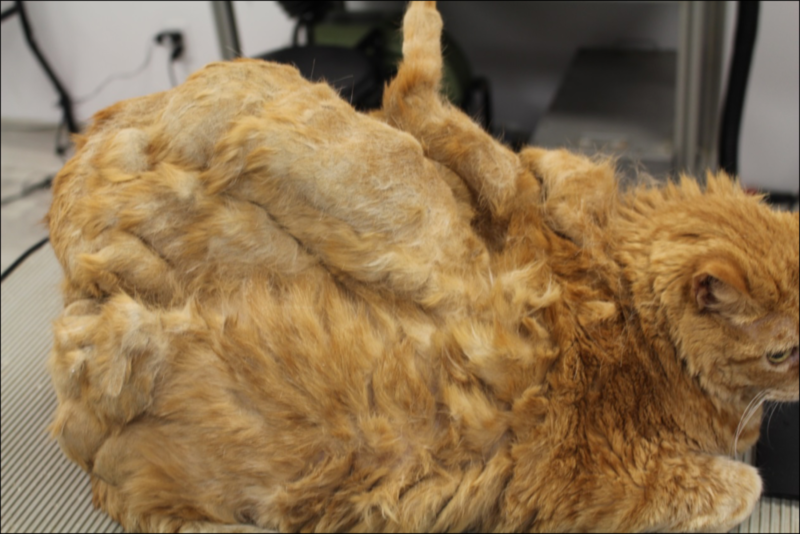 Here is one of our worst examples of a cat who failed epically at grooming itself. This picture shows the depth of the mats. We found twigs, and feces within the mats. Do not fear this cat left our salon happy and overjoyed to be freed of its pelt. Now, not all cats come to us with conditions like this. Many come to our salon on a maintenance program. The client's request is to have their cat's coats cleaned of grease and debris; to have their nails adequately trimmed and their ears, eyes and sanitary area cleaned. Once our clients experience what a clean cat should look and feel like, our education is complete. 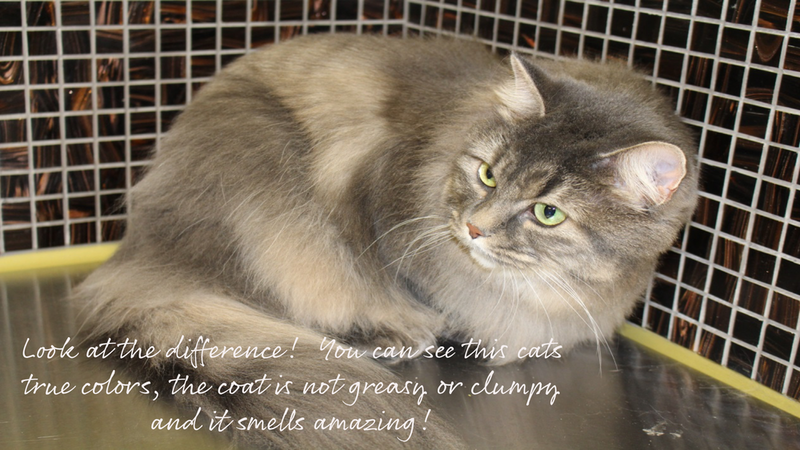 Here are just a few before and after pictures to get a visual sense of the difference from a dirty cat to a clean cat. The results of a clean cat are more than a visual benefit; they are also a health benefit. A fresh, well-groomed cat can eliminate hairball issues, shedding issues, lessen allergies, improve skin conditions, eliminate ingrown nails and more. The myths following cats and their grooming needs are de-bunked, and it is through education of both groomers and their clients, that so many of the feline skin problems and coat conditions are being remedied. Trusting a Certified Feline Master Groomer is knowing they have been trained not only in the feline grooming aspect but also the physiology and psychology of a cat. Interested in becoming a Certified Feline Master Groomer?